The Churches of Constantinople in the East and Rome in the West celebrate liturgies in honor of Mary's birth from the sixth and seventh centuries on. The origin of the liturgy is traced to the consecration of the church in Jerusalem in the sixth century that has been traditionally known as St. Ann's Basilica. The original church built in the fifth century was a Marian basilica erected on the spot known as the shepherd's field and thought to have been the home of Mary's parents. After its destruction and reconstruction in the sixth century, the basilica was named in honor of St. Ann. By the seventh century the liturgy was also celebrated in Rome where it had been introduced by monks from the East. From there, it spread throughout the West, and by the thirteenth century the liturgy had developed to a solemnity with a major octave (eight days of commemoration prior to the liturgy) and a solemn vigil which prescribed a fastday. Pope Sergius I (687-701) established a procession (a litania) from the Roman Forum to St. Mary Major for the feast. During the reform of St. Pius X, the octave was simplified, and in 1955 Pius XII abolished it. The liturgy received the rank of feast. The date, September 8, was chosen as the eighth day (an octave) after the former Byzantine New Year. Although Mary's birth was celebrated on various dates throughout the centuries, September 8 predominated. The feast celebrating Mary's Immaculate Conception, December 8, (a liturgy instituted later) was set to correspond to nine months before Mary's birth. The present feast forms a link between the New and the Old Testament. It shows that Truth succeeds symbols and figures and that the New Covenant replaces the Old. Hence, all creation sings with joy, exalts, and participates in the joy of this day. ... This is, in fact, the day on which the Creator of the world constructed His temple; today is the day on which, by a stupendous project, a creature becomes the preferred dwelling of the Creator. Your birth, Birthgiver of God, announced joy to the whole world. From you came the Sun of Justice, Christ our God. He released the curse and gave the blessing. 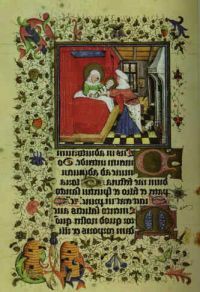 Sacred Scripture does not record Mary's birth. The earliest known writing regarding Mary's birth is found in the Protoevangelium of James (5:2), which is an apocryphal writing from the late second century. What matters is not the historicity of the account, but the significance of Mary's and of every person's birth. In Mary's case, the early Church grew more and more interested in the circumstances surrounding the origin of Christ. Discussion about Mary throws light on the discussion about the identity of Jesus Christ. 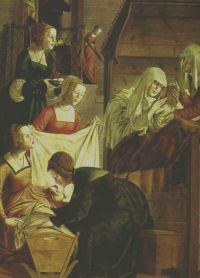 Mary's birth is usually included as one panel in art series on Mary's lifestory; however, it is also a theme depicted by itself. The oldest known representation is on a sixth century diptych in Leningrad. From the very beginning, the paintings were modeled on the type used for the birth of Christ, where the mother is in a lying position. Instead of a landscape, a cave or a stable as in the birth of Christ, various types of architectural structures are depicted which represent an interior dwelling place. 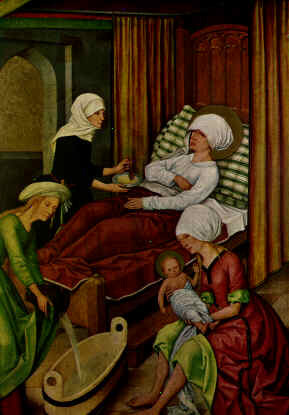 Ann, the mother of Mary, is lying on a couch or on a bed. Usually, servants are busy bathing the child. Starting around 980 the compositions depict three women. One very simple painting, the so-called Berlin diptych from the early twelfth century, shows a servant handing Ann a bowl, while the child lays all tucked in on a little bed. These representations show the natural and joyful event of Mary's birth. Other works place the stress on the destiny of the child and the teachings of the faith. Pietro Lorenzetti (1342, Siena, Museum dell'Opera del Duomo) places the birth in a side room of a church. On Wolf Huber's Field Church altar, angels participate in the birth through an opening in the heavens. Albrecht Altdorfer places Mary's birth in a church with pillars surrounded by angels (1525, Munich, Alte Pinakothek). 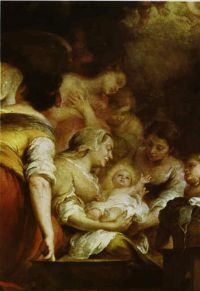 During the baroque and the rococo periods, heaven and earth unite in the paintings in happy profusion at Mary's birth. During the later periods, especially after the fifteenth century, the representations of the birth of Mary highlight her destiny as the immaculate virgin, the child predestined by God's choice to bear the God-man, Jesus Christ. The words of the mystic, Mary of Agreda (1602-1665), describe well the way art would attempt to depict this birth. Mary of Agreda wrote, "Not only was the Word conceived before all these by eternal generation from the Father, but His temporal generation from the Virgin Mother full of grace, had already been decreed and conceived in the divine mind. Inasmuch as no efficacious and complete decree of this temporal generation could exist without at the same time including his Mother, such a Mother, the most holy Mary, was then and there conceived within that beautiful immensity, and her eternal record was written in the bosom of the Divinity, in order that for all the ages it should never be blotted out. She was stamped and delineated in the mind of the eternal Artificer and possessed the inseparable embraces of his love." 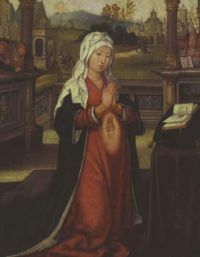 Geburt Mariae, Marx Reichlich (1460-1520), first half of the 16th c.
Today is the birthday of the holy Virgin Mary whose life illumined all the Churches. In many cultures, the birthday of every person merits a celebration. Family and friends gather to wish the "birthday child" many happy returns. There are well-wishing, balloons, cards, cakes, candles, a favorite meal, there are gifts and jests--all the things that say, at least once a year, "You are special, there's only one of you, we are happy that you exist." So, it is for the people of God and Mary. Christopher O'Donnell, At Worship with Mary; E. Sebald, "Kunstgeschichte," and L. Heiser, "Liturgie Ost," and Th. Mass-Ewerd, "Liturgie West," in Marienlexikon 2; A. Valentini, Dictionary of Mary; Jean Guitton, The Madonna.